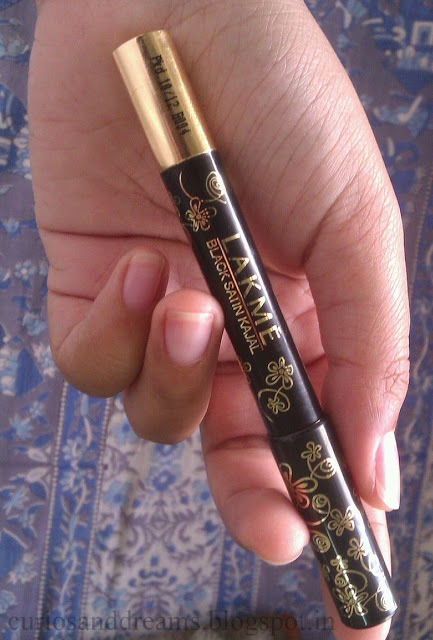 I really love love love my Amway Attitude kajal coal, but then it costs around 350 INR and since its really creamy it gets used up pretty quickly. (A month or so with everyday use.. sometimes with twice a day application). Living on a budget isn't very easy and I could not afford to spend a lot on that one every month. So for an everyday purpose I was looking for a cheaper alternative (something I can make-do with for a while.. when I am out in the neighbourhood). 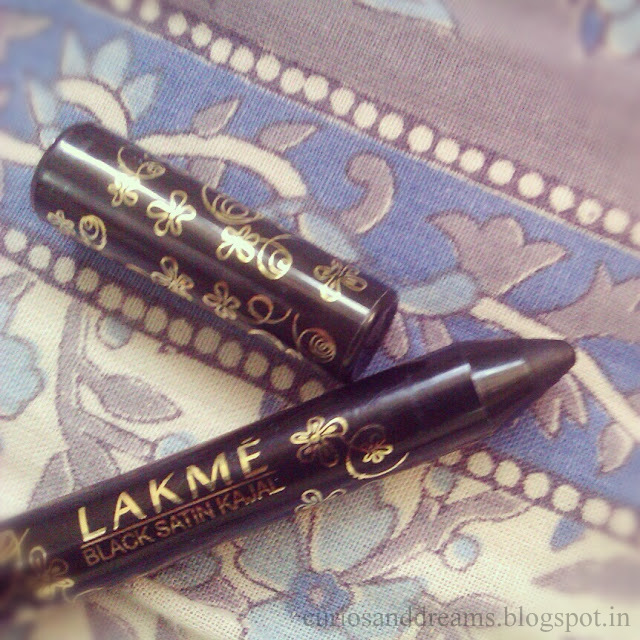 Lakmé Black Satin Kajal was launched in the Gypsy Collection. - Jet black kajal for one store blackest black delivery. - For sharp intense lines or smudged smokey finish. - Glides on super soft and smooth, with a glossy satin finish. - Water resistant formula that keeps colour and shine in place without spreading easily. ● The pretty packaging... Black with twining spiral golden floral design. 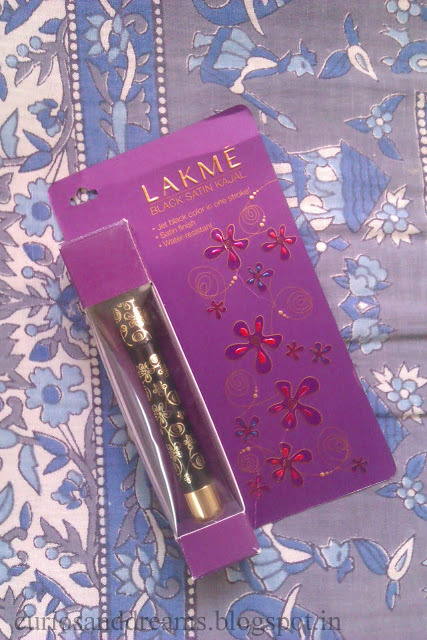 *Very Pretty* It comes in a purple cardboard packaging, which is quite bigger than the kajal itself but pretty nevertheless. ● Intense and richly pigmented. Jet black as claimed. With one stroke. ● Glides on very smoothly. 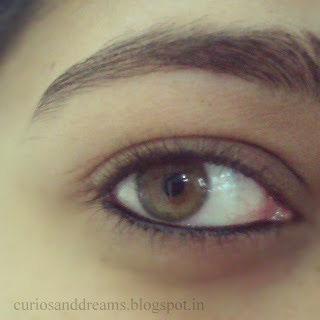 The kajal is soft. I did not experience any tugging. ● Nice glossy finish. (Different from the kohls which are usually matte). ● Can be sharpened easily (I use the lakme sharpner) so no fear of bacterial growth and stuff. 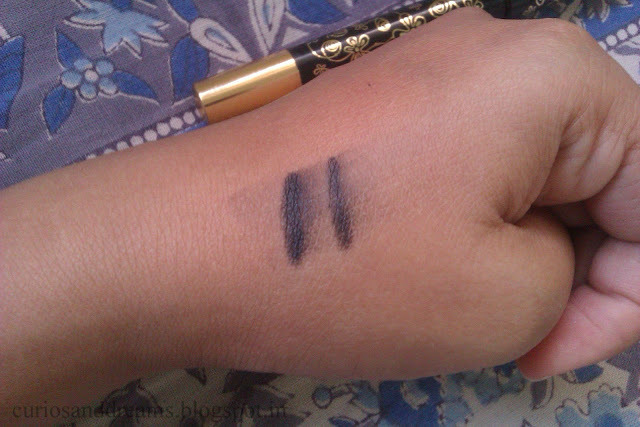 ● Can be smudged for a smokey eye look, topped with grey/brown/black shadow. (I suggest using it with a primer though on your lid beacuse it is a bit oily and can spread easily or crease). ● Fragrance free and did not cause any allergies when I used it. ( Can't say about people who wear lenses though). 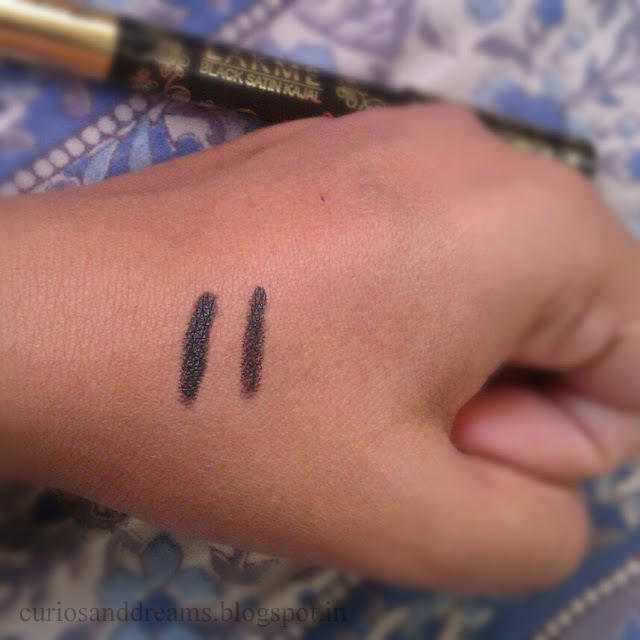 ● If you are using it on your eyelids for a smokey look then it will need a primer... You wouldn't want racoon eyes. ● Not water proof.. I wish it was, but we can't have everything, can we? Although it is water resistant. Any rubbing= smugding+ raccoon eyes. ● No list of ingredients mentioned. I wish I knew what went into the product. You can seal in the kajal by using loose powder under your lower lash line or dusting some black eyeshadow over the kajal (Basically removes any oil/moisture from the area). This will make it last longer and prevent the smudging to a huge extent. And here are some pics. Its really hard to click pics of yourself, that too with a phone. 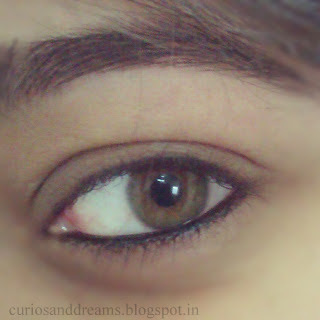 Sorry for the not so good images, but I hope they give you an idea (I am just wearing the kajal alone).